Plastic is a miracle substance. Like glass, plastic is waterproof and air tight, but plastic is flexible and much lighter than glass. Infants can roll over and get tangled in a thin bag like a dry cleaning bag left on a bed. Infants and toddlers can pull a bag over their heads and suffocate when they are unable to get them off. Sleeping infants can fall asleep next to a bag, roll over against it and suffocate. Dry cleaning bags, because they are large and extremely thin, are the most dangerous bags around the house. Gargage bags and thin plastic grocery bags are also dangerous around infants. There should be no plastic near an infant while he or she is sleeping. Even big, fluffy pillows and blankets can potentially suffocate an infant -- infants do not have the strength or awareness to get away from something once it covers the face. Plastic dry cleaning bags should be taken off of clothes and thrown away immediately. They should not be left on the bed, on the floor or on a chair where a child can reach them. They should not be left on clothes hanging in the closet. Plastic garbage bags chould be kept in a child-proof cabinet when not in use and should never be left on a bed, chair or floor where a child can reach them. Plastic garbage bags filled with clothes have killed children who fell onto one or rolled over against one while sleeping. Keep plastic grocery bags and other plastic bags out of reach of children at all times. Never leave any sort of plastic bag in a child's crib. 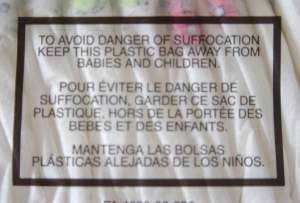 Never cover children's mattresses or pillows in plastic bags. See also the article on Balloons.